"Let it be a mess," says Rob Sheffield, offering some suggestions for shaking up the award show format. Tina Fey and Amy Poehler showed during their three-year run on the Golden Globes that a messy award show is a great award show. "A simple formula: celebrities plus live TV plus free champagne equals a few hours of insanity," says Sheffield. Another suggestion: Get a star to host. "A few years ago, the network bosses got a silly idea in their gullivers — the idea that an award show’s job was to promote the in-house late-night franchise," says Sheffield. 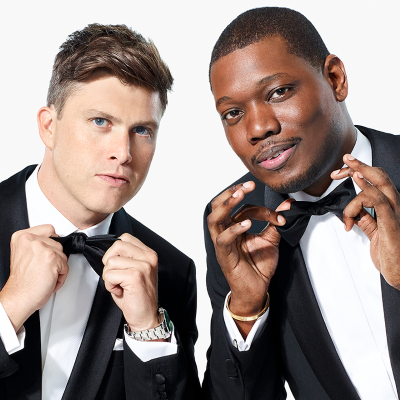 "So every fete began to get hosted by the network’s resident late-night straight white guy. Hey, what a crazy coincidence: This is when ratings cratered. Sure, Jimmy Kimmel does a fine job hosting the Oscars. That’s not the problem. The problem is he does an equally fine job five damn nights a week — so do Colbert, Fallon, Myers, Corden. It’s just not a big deal to see these guys put on a suit and tell some jokes. So they’re a fatal glamour drain — as Colbert’s former alter ego might have put it, they kill the eventiness. When LL Cool J hosted the Grammys, it was a must-see every year. But ever since Corden took over, the ratings have been fading faster than Canibus in a rap battle. So it’s simple: bring back LL. Mama said knock you out!" Who played Teddy Perkins on the Emmys? Jay Pharoah? Eric Andre? Danny Pudi?